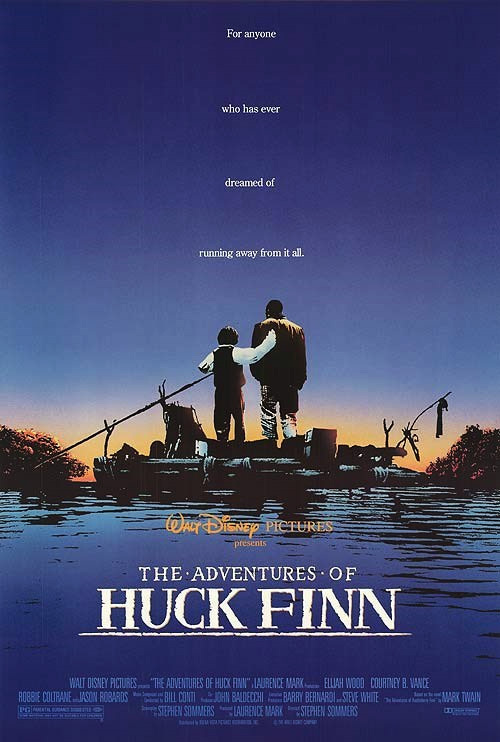 This is the fifth screen retelling of Mark Twain's river saga, given a contemporary polish, courtesy of Disney. Elijah Wood plays Twain's answer to Bart Simpson and Courtney B. Vance is his good buddy Jim. VIOLENCE/GORE 5 - Several fist fights erupt, with solid, painful-looking blows. Huck's father threatens him with a knife, and Huck holds him off with a rifle. Eventually the father is shown dead of a gunshot wound. Huck kills a rat by winging a bottle at it. He also shoots a boar, drags it around and smears its blood on the walls of his father's cabin. During a gun battle between feuding families, a young boy named Billy is shot (off-screen) and his corpse is found floating in the river. A slave receives a whipping, just out of camera range. Huck's companion, Jim, shows the deep welts of a whipping he's been subjected to. During a mob scene, a shooting and a stabbing occur. Two villains are shown to have been coated with hot tar. A noose is placed around Jim's neck, but he does not hang. LANGUAGE 2 - Huck enjoys salty language, consisting mainly of mild profanities. DISCUSSION TOPICS - The mindset behind slavery is examined, though hardly in-depth. Alcoholism and child abuse are demonstrated by Huck's father. Huck smokes a pipe. MESSAGE - The value of friendship is the point most strongly delivered here.